It has been quite a while since I have blogged on a Japanese establishment. My regular Japanese haunt folded up after there was a change of management, and consequently, the service and food quality went downhill. Since then, it has been challenging finding a spot worth writing about, in addition to the gastronomic wanderlust that has taken my attention in many directions. 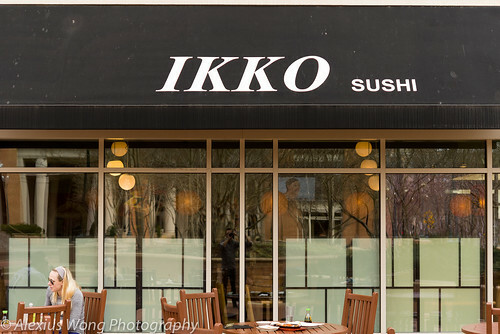 However, recently, I read reviews on Ikko Sushi located near downtown Silver Spring, MD, and I paid it a visit for lunch during a warm Saturday afternoon. Situated on the ground floor of a recently built apartment building, it holds a sushi bar and a few tables inside. But I chose to sit in the patio facing the building courtyard in order to take advantage of the light for the photos, and to enjoy the balmy temperatures, a nice change from the frigid week before. After taking a seat, I perused the menu which seems to cover many categories of the cuisine that I am familiar with. With the help of online recommendations, I honed in on some of the raved dishes that this place seems to get right. 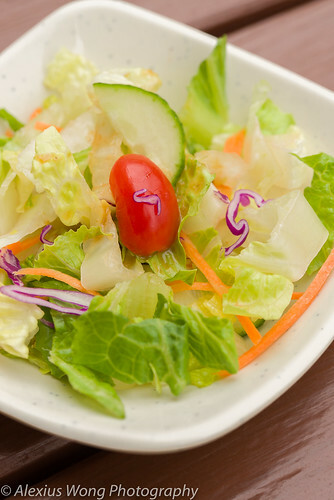 The serving of a complementary salad set the right mood, although I found it rather pedestrian and lacking in “hand flavor” or a sense of proper attention to the ingredient no matter how lowly a lettuce leaf could be. However, the well-made ginger-miso dressing was the right element that perked the leaves into something quite palatable. 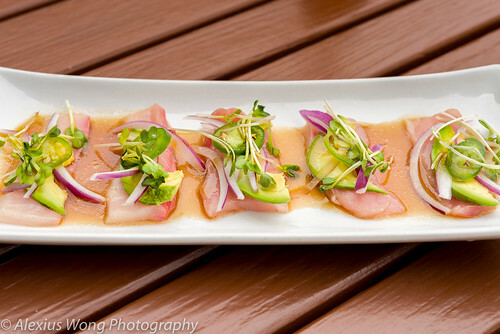 For my first course, I ordered the Yellow Tail Carpaccio. The beautiful plate arrived with raw slivers of the mild fish dressed up and sitting on a pool of sauce. One bite into a piece pointed to the quality of the sushi. 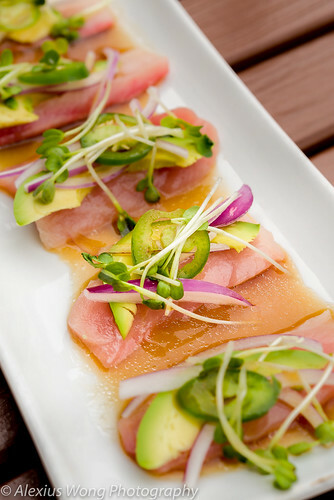 The slices of seafood were cut to the perfect thickness that exuded its mild clean ocean flavors. The accoutrements on top added more interest with the right crunch from the sweet red onion, spicy jalapeño pepper, and herbal micro green, along with some creaminess from the ripe avocado. Each packet was perfectly liaisoned by a sauce made from citrusy yuzu juice, soy sauce, and a tinge of sesame oil, making it the perfect complement to the fish’s clean flavors. This was a great starter indeed, and I was looking forward to the next dish. 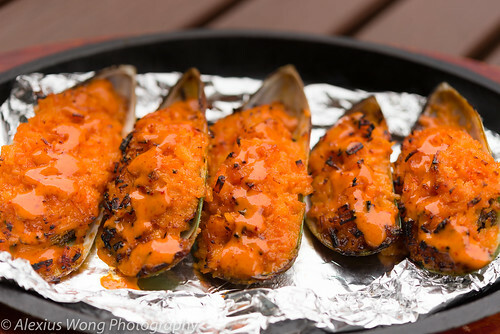 Fire Mussels was high on the online recommendation list and I decided to follow the suggestion. When it arrived, I was not too keen of the amount of stuffing on top as well as its fiery color. But with one shell, my mind took a U-turn. 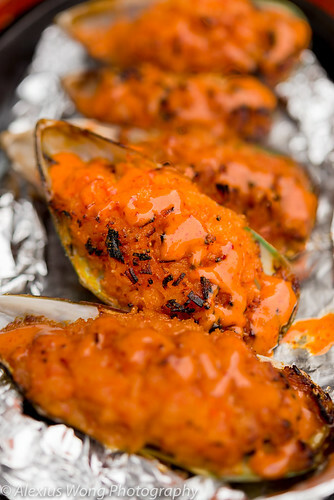 The mussel tasted fresh and was rather moist from the proper cooking and the small pool of moisture under the flesh. The topping took me by surprise by its seasoning, replete with some spice heat, a tinge of sweetness, and creaminess in the flaked Surimi stuffing, which did not overtake the seafood despite its bright appearance. Despite the overwhelming quantity of stuffing, which I eventually scrapped off some of it, I agreed with the online raving comments on this appetizer, and I finished off every shell with some degree of satisfaction. Initially, I thought of critiquing on a Ramen noodle dish. But with the advent of Spring, I quickly changed my order to some lighter sushi rolls. My waiter was quick to recommend the ones made with multiple of ingredients lathered with quantities of sauce, which I find such Westernized creations to be overwhelming and quite an assault to the simplicity and purity of flavors. 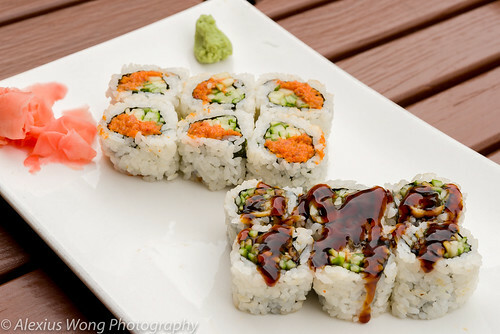 Getting away from the “hits list”, I went a la carte and ordered two rolls. The first was Eel roll. The flesh was tasting very clean in flavor, devoid of the excessive Omega oil that a less-than-fresh cut would exude. The traditional sweet brown sauce was not too sweet or excessive without overwhelming each bite. The other roll was Spicy Tuna. The mashed tuna mix was spicy, had a hint of acid and a good amount of sesame oil that matched the oily seafood. The finely julienned cucumber was the perfect cooling complement to the spicy mix, and this flavor and textural combination made each bite irresistible. 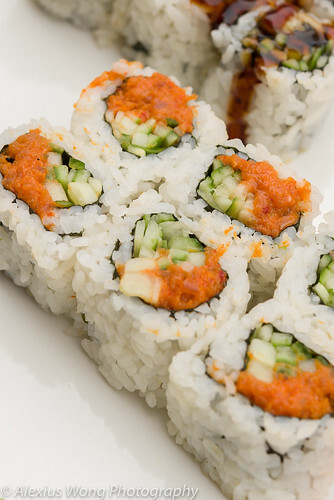 For both rolls, the sushi rice was perfectly cooked with its grain retaining its integrity and not mushy at all, properly seasoned with a hint of sugar and vinegar. The nori weed was aromatic and slightly nutty from some toasting. All in all, this was proper sushi and it definitely points to a skillful hand. Ikko Sushi is a wonderful find. Despite its large menu, it seems to get it right judging by the dishes that I tasted that day. I still recall the wonderful mild yellow tail fish that was made more flavorful by the crunchy toppings and that sippable citrus sauce, the moist large mussels topped by a fiery and creamy faux crab stuffing, and the well-executed sushi rolls with the mild tasting eel and the perfectly balanced spicy tuna mix. Sometimes the success is in the simple details without overwhelming the senses with overly layered flavors that tend to mask the ingredients – their integrity is the canvas itself. 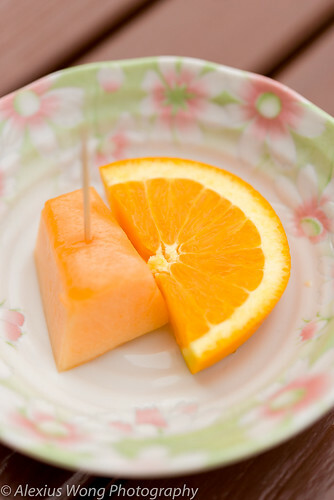 This attitude was even evident in the complementary fruit consisting of a single sweet slice of orange and an equally delectable piece of cantaloupe. With such venerable approach to Japanese cooking, Nikko Sushi is definitely worth more visits on my part.